Fall has finally arrived here in Massachusetts, and it's a great time for outdoor and landscape photography. Nothing beats the golden light and changing leaf colors that September and October bring to New England. 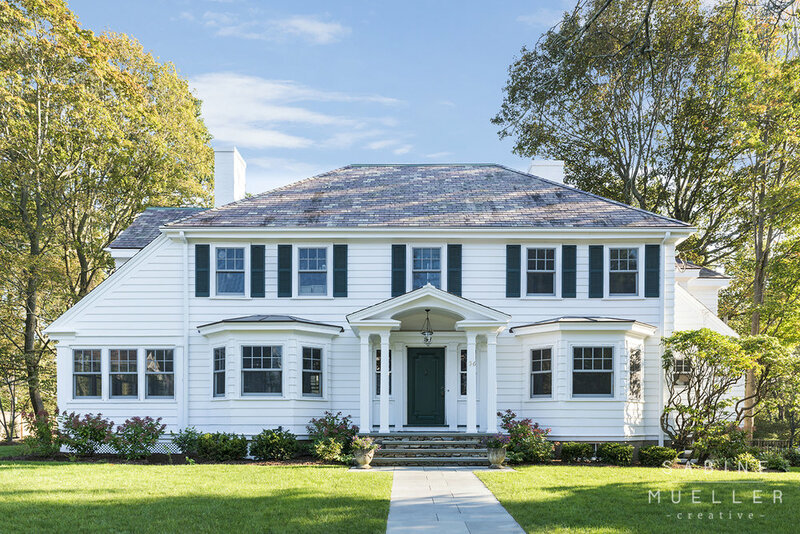 I was very excited to photograph this gorgeous house in Waban for the talented Inge Daniels of Inge Daniels Design & Landscape Architecture. 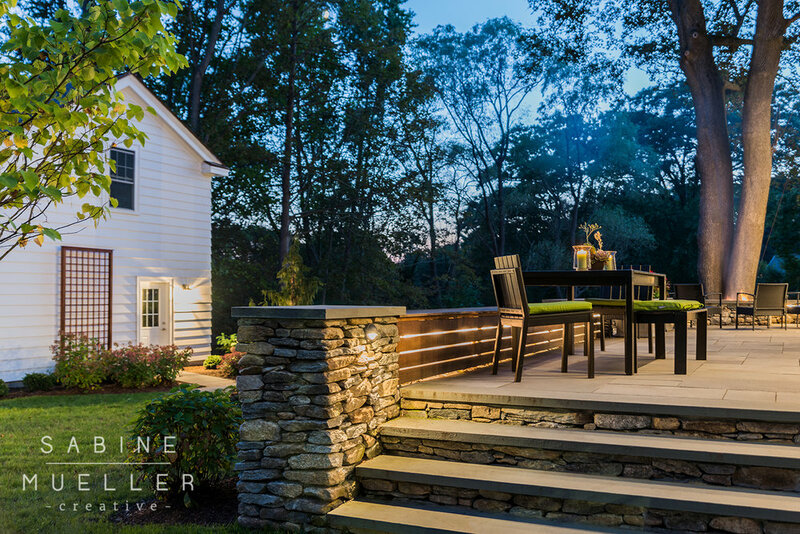 What really makes this patio dining area stand out is the illuminated bench seating, and the fireplace with views into the adjoining neighbor's tree canopy. 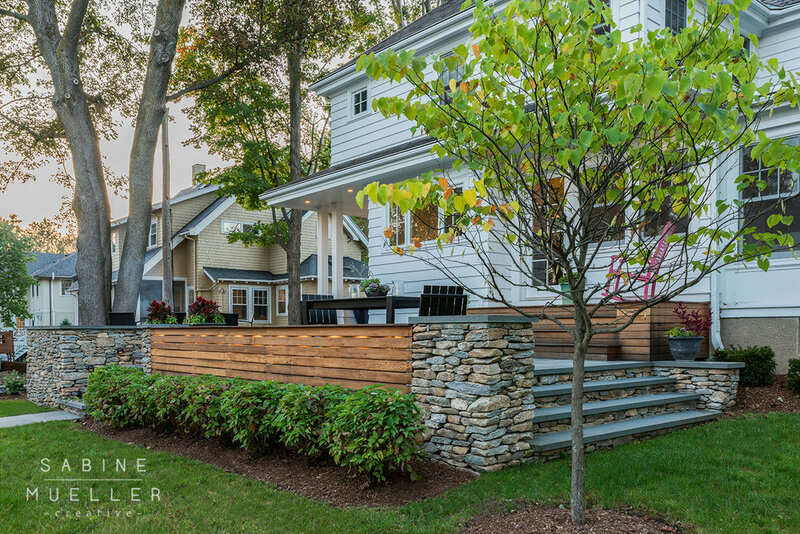 IDDLA utilized fieldstone and bluestone with tropical hardwood to create a warm and inviting environment on this terrace. The internal light source of this comfortable bench creates a beautiful ambience on cozy summer and fall evenings. In my quest to learn more about the field I chose to photograph and the people behind it, I have decided to find out more about the architects and designers behind the projects I capture. Understanding their thought process behind each design and what made them choose this particular type of work not only lets me get to know my clients better, it also helps me see each project from their perspective. So here goes our first "7 Questions With..." Interview with Inge Daniels of Inge Daniels Design LLC. Please also visit her Houzz profile HERE. Inge creates amazing landscaping design. If you're looking for someone to make your garden and house look absolutely stunning, be sure to contact her! degree in landscape architecture and haven’t looked back since. I just love landscape - its shifting, seasonal, ephemeral quality; the way the right design can draw out the identity of a place; and the effect it has on our perception as we move through it, i.e. squeezing between contained space, i.e. squeezing between contained space that then opens into a clearing, the sounds of grasses or leaves whispering and the tenor of paving beneath your feet. I feel lucky to work with the palette of stone, wood and plants to improve our world - to build sustainable landscapes and help people connect with the natural world. Being in the middle of schematic design for a project is probably my favorite part. That’s when ideas are nascent and the project can go in any number of different directions. It’s painful sometimes until a design really starts to coalesce but there’s a certain point where it finds its voice and takes on a life of its own. That moment is awesome. The balance of my work involves taking that vision, developing it and turning it into a reality. Seeing the landscape realized, especially a few years down the road when it really starts to mature, is incredibly rewarding. What would you consider the biggest challenge/s? Balancing work flow in a small office. It’s impossible to predict work flows and it’s hard to turn down exciting jobs so I often take on too much work. I haven't hired on help yet so it’s often late nights, burning the candle from both ends. These are the things I’m working on improving! Do you have an upcoming project that you are excited about? Yes, an entry landscape at a private Quaker school in upstate NY. I’ve done several projects at this school but this one will make the boldest statement so far about this great campus and its forward-thinking drive toward sustainability. ie. The campus currently has an iconic allée leading into the heart of the campus that is in decline. One of the things I’ve been researching for this project is what a sustainable allée could be like. An allée is typically composed of a single tree species, but with our climate changing we are seeing more pests and therefore less predictability in how tree species thrive. To have a single species is asking for trouble. If they fail either they all succumb or you have gaps in your continuous lines of trees. It’s a fascinating problem. We are building Phase 1 of the entry landscape this fall. Later phases will include the allée as well as a wetland renovation and outdoor classroom. Do you have a certain approach from start to finish for each project? Different types of project require different scope. For some clients I just do hourly consultations to brainstorm ideas or provide suggestions. For some clients I just design and oversee the build on one discrete area of a landscape. However for most clients I start by developing a master plan that considers the entire site - its aspect, wind, soil and existing landscape features - and meets the programmatic requirements of the client. Once we’re all agreed on that conceptual plan I progress to developing the design with specific materials, plants and details and develop the appropriate drawings to get the project bid and built. I work closely with the landscape contractor, especially with layout of paths and plantings, to ensure the high quality of the finished result. Is there a specific project you are most proud of? 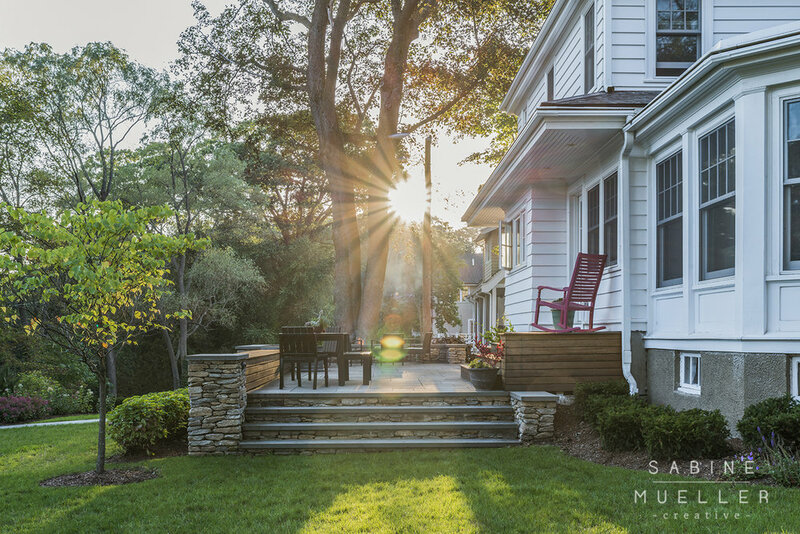 It’s hard to pick just one - it’s been an exciting few years since launching my own LA studio - but I can’t wait to see a residential project I recently designed and built in Newton fully complete next spring - we are a few perennials and carpentry projects shy of completion. It’s a corner lot and as part of the master plan I helped them locate a detached garage and completely reconfigure the back entry sequence and family terrace. The terrace itself is really neat with a built-in wood fireplace that looks out into the canopy of an adjacent property and seatwalls that wrap around. Some steps and one section of seatwall I designed in wood to have a warmer touch. I designed the seatwall to be lit from within so it emanates light through the wood slats. My client is hands-on and constructed it himself. I’m fascinated by landscapes at night. What would you do if you had pursued a different career? As with all jobs there are moments of tedium and frustration, but this is honestly my dream career. It draws upon so many different disciplines: ecology, botany, hydrology, soils, climate, perception, aesthetics, psychology, sociology, urbanism, architecture, art and design… to name a few. I consider myself a lifelong student so hopefully there's no end to my learning curve. Like all good things eventually have to, ABX 2016 - the annual Architecture Boston Expo - has come to an end. And of course I had to visit and take a look at all the vendor booths, installations, and the photo exhibit, which was spread throughout the expo floor. It was great to see many familiar faces this week and also to meet new people from all over the world - particularly from my home country, Germany, which gave me the chance to speak my native language for a bit, for example with the fun crew of Gaggenau Kitchens. I just had to stop by their booth - not only because I was hoping to speak to someone from home - but also because I've been a long-time fan of their timeless designs. The company just celebrated their 333-year anniversary! Some great eye-catchers were the interesting installations on the expo floor, such as interactive games and the big balloon installation, in which the opening night party was hosted. Below is a picture of this year's winner of the Quad Competition (sponsored by What's In, Stantec and ABX2016), an international design competition for a social space installation. The task was to create a meaningful and impactful installation that encourages social interactions. Cost and feasibility of construction were critical factors to consider in the process. The winning design (among 6 finalists) was created by KiKi ARCHi, a Tokyo-based architecture design firm led by Yoshihiko Seki. This has been such an amazing event, and I can't wait to see what the BSA has planned for next year! One of the many reasons I love what I do is that moment when you finish crafting an image and get to compare the beginning to the end result. Ah! Beauty! You often don't see it but many, many hours go into creating one single photograph. The work on site is just the beginning. And if a picture is done well, you don't really see what went into creating it (unless maybe you have a trained eye). Designers, architects, engineers...they all put their heart and soul into creating beautiful spaces and designing them with a purpose in mind, so the photograph should do their work justice. Our eyes see spaces differently than the camera does and therefore, we have to work a little magic with lighting techniques on site and in post-processing. To give a better idea of the difference between a photo straight out of camera without any lighting and one that has been professional staged and edited, I have created a new "Before + After" section on my website. It's a great way to have a direct comparison and show the difference. It's also really fun to play around with if you need to kill some time. See it for yourself right HERE and enjoy! Welcome to my blog and first blog entry! I am really excited about this, since I love to write and share things that inspire me. A little info about me and what I do: My name is Sabine (pronounced like Sa-bee-nah - for all my fellow Bostonians out there) and I am an architectural photographer, food truck fan, outdoor enthusiast and movie dork. I was born and raised in Germany until I decided it was time to spread my wings and see what the world looks like across the Atlantic Ocean. So I moved to the United States in my early twenties to improve my English for a year...or so was the plan at least. To my mother's dismay, I really liked it here and decided to stay just a little longer. It has been exactly 10 years now and I think it is safe to say my English has improved. My background is in Hotel Management and I spent the first years of my stay here in a uniform, greeting and serving guests from all over the world in one of Boston's biggest hotels. A few years ago, I decided to take classes at the New England School of Photography and fell head-over-heels in love with architectural photography. I have always had a deep appreciation for great design and architecture but it had never occurred to me that photographing it would be my secret passion. So I traded in the uniform to capture New England's buildings and construction sites, crawling through mud in a hard hat with a smile on my face. Hope to see you soon at a construction site near you!